KIEV, Ukraine—Moscow announced earlier this week that it had concluded a contract to deliver "20 or more" of the "heavy multi-role fighter aircraft Sukhoi Su-35 to Egypt." 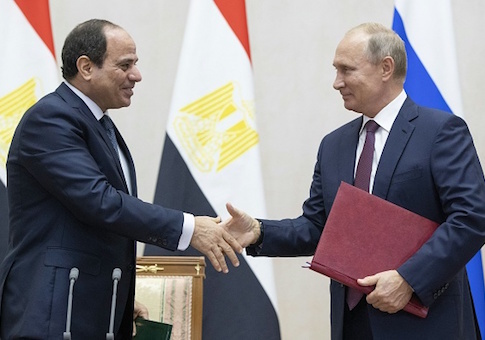 The announcement of the major arms transfer to Cairo in the Moscow daily Kommersant is raising concerns in western capitals about the increasing influence of Russia in Egypt. The value of the contract is reported to be $2 billion, which would make the aircraft more than $100 million per unit. The price is supposed to include a full complement of missiles and other air-launched weapons as well. This would be the highest price yet paid for this aircraft by an export customer. Despite disparity between the cost of the Su-35s and Egypt's ability to pay, a subsequent report by the Russian Interfax news agency quoted Russian officials as saying that the Egyptian aircraft are already on the assembly schedule at the Komsomolsk-on-Amur Aviation Production Association plant in the Russian Far East province of Khabarovsk. This production center is the sole facility for producing this aircraft type and has been filling Su-35 orders for both the Russian Aerospace Forces and the PRC's People's Liberation Army Air Force. Sources in Moscow told the Washington Free Beacon that the Su-35 purchase is likely to be financed with loans from Russian state bank channels. Informed speculation in Moscow is the sum is most likely not ever to be repaid. What is more likely, more than one Russian source stated, is that the Su-35 deal is a "giveaway" in a larger plan of President Vladimir Putin's government. This plan has two major strategic objectives. One is that Putin seeks to have the same level of influence and presence in Egypt that the then-Soviet Union enjoyed up until the latter half of the 1970s, when the United States became the prime security partner of Egypt under then-President Anwar Sadat. Moscow has been building up to this with a series of defense acquisitions that has made Egypt, in the words of Kommersant defense affairs editor Ivan Safronov, "one of the major serious buyers of Russian military hardware." A secondary objective is that Putin wants to have a wide footprint—both in diplomatic clout and the presence of military hardware—in North Africa and the Middle East that also supports the "Russia is back" message. "You can look upon the build-up of Russian weaponry in Egypt and the intervention by Moscow's air power in the conflict in Syria as ‘book-ends' in a geographic game plan," said a Russian defense analyst. "This not only shows that Russia is able to project power into regions outside of its European neighborhood, but also that some of Moscow's latest weapons appear to be on par with their western analogues." Warnings about the impact of Russia's growing military presence in the Middle East date back to last fall when the Atlantic Council published an analysis on their webpage concluding that the "military intervention [in Syria] allowed Russia to be the key actor in the conflict and its post-conflict reconstruction. It demonstrated Russia's fundamentally new military and political capability on the international scene." The introduction of the Su-35 into the region also has implications for the overall security situation. The aircraft is described as a "Generation 4++ fighter"—meaning that it possesses a set of on-board systems and the capability to carry a selection of advanced air-launched weapons that approaches that of the most advanced U.S. military's 5th-generation aircraft. "The Russians use the ‘4++' label for the Su-35 to be able to claim they are able to achieve 90 percent or more of the capability of the far more expensive U.S.-made F-22 and F-35 platforms, but a lower cost," said a NATO intelligence officer who spoke to the Free Beacon. "This is why the Su-35 is the only Russian aircraft that has been purchased by the Chinese in more than a decade … the Su-35 represents significant combat power that goes far beyond the previous-models of Russian fighters acquired by Beijing in the 1990s and in the last decade." What remains to be seen is how Israel will react to the Egyptian acquisition. The Su-35 will become the most capable aircraft operated by any of Israel's Arab neighbors. It is as an effort by Moscow to neutralize the advantage that the Israeli Air Force has with its recently-acquired F-35 stealth fighters. Israel will eventually have 50 of these aircraft in its inventory, but currently operates only nine of the single-engine fighter. The Su-35s will be delivered to Egypt from 2020 to 2021. They will join a growing air force that currently operates a mix of Russian, French, and U.S.-made aircraft. Egypt's Su-35 acquisition may fall under the Countering America's Adversaries Through Sanctions Act, which was signed into law by President Donald Trump in 2017. The legislation is designed to punish Russia for numerous actions that violate international norms—including interference in the 2016 elections. Under that legislation, countries transacting business with Russia's defense and intelligence entities can face secondary sanctions from Washington. This entry was posted in National Security and tagged Egypt, Military, Russia. Bookmark the permalink.